The Examiner has discovered that Amazon France has a Mortal Kombat "Game of the Year" edition listed for pre-order right now. Could this be one of the Unexpected Surprises that Ed Boon has been teasing? There is not much information, other than a release date of February 28th, 2012 and a price of 39.99 Euros ($53.49 in U.S. dollars). Don't worry about the price conversion as in Europe new games typically release for 50-70 Euros so this is a price, and would possibly translate to a $39.99 price in the US. If this "Game of the Year" edition follows suit of other GOTY releases it's likely it will include all the previously released DLC on disc or with redemption codes inside of the box. I would expect an official announcement of this edition to happen sometime in early 2012 after the Holidays are over, so stay tuned. 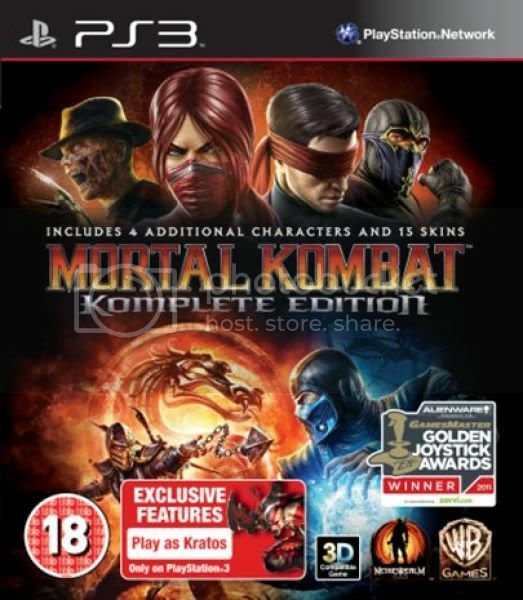 Updated 12/2: Appears that the UK ratings board BBFC has now listed a "Mortal Kombat Komplete Edition" in the UK as of today. What this likely means is what it will be called will either vary by region or a final name has not yet been decided. Stayed tuned as more details are likely to be revealed soon. If any game deserves the GOTY title, it's Mortal Kombat. Wow I see what Ed did there. "No more DLC characters"
It's unlikely there will be anything NEW to this. A typical GOTY game re-release is not a money grab release (see Ultimate Marvel vs Capcom 3 or Super Street Fighter IV) but actually just a repackaging of the game with all of it's available DLC. Ed has been fairly vocal on Twitter to not expect more DLC for MK9. A typical GOTY release is to sell it to customers who didn't buy it initially but may now that they heard it won a "GOTY" award and also to know it's a lower price now and with all the included DLC. Not all developers are not in the business of fleecing fans by forcing them to buy a whole new game for a few new characters. I personally expect the next console MK game with new stuff to be MK10. That is our guess as I've stated above, a GOTY edition would include all the previously released DLC but nothing else new. As I said this is not for people who own the game already, but to entice those who didn't buy it to finally pick it up. Or, to buy it on a separate console, which is why I'm planning on buying it. GOTY? MK9 was good... But not that good. PS Vitality will be release on 2012 Feb, are you sure we are not talking about the same game ? MKVSDC was re-released as greatest hits, I wouldn't be surprised to see a GOTY edition of MK9. The Amazon posting shows that it's for the PS3. So it won't be MKV. UMK9/MK9GOTY is a great idea, except Australia still hasn't finished bringing in the new R18 rating. Porting studios like to port GOTY editions of games. Especially since they can port the game with all the DLC in one go and being GOTY is like an assurance it'll sell well it seems. Being GOTY makes the game ripe for porting. So I could see a company like Aspyr swooping in and porting MK to the platforms they port games to that is PCMac. Steam has a feature that allows you to purchase the game once and download to either platform. Aspyr is known for porting console only franchises over to PCMac such as Star Wars The Force Unleashed and Guitar Hero (and made that compatible with those plastic guitars). This may just be wishful thinking but they could be announcing this by the end of the year for release early next year. I knew it would. It was probably an unforseen leak. Well, at least now we know one of the 3 surprises (I hope Vitality is not one). Ports often usually come later and a lot of times aren't announced until they are close to ready.... more or less. Depends on a lot of factors. Many porting studios are also tight lipped and are probably under contract to not say anything until the original publisher is ready. On the other hand I'm not saying it's a sure thing but yeah, they do tend to like to port GOTY or "complete" editions. So having GOTY edition makes the game at least slightly more attractive to them. Well I'll get the Freddy dlc I didn't buy...but really don't want either... lol I wonder though, how will Kratos be handled...? I wonder if changing the name will mean adding more new content. One of them - probably. The main one - definitely no. it would be nice if they supported new costumes. none of the dlc has alternates. also make dlc compatible packs mandatory. Well actually it's not confirmed if it's a GOTY edition (with all DLC included) or a Komplete edition (ala SFIV with additional contents) since we have both definitions. It could be anything. ^ How would they promote something they haven't even announced yet? Anything new about this edition? I'm still waiting to play the game, but don't want to buy the regular edition if there is a possibility to buy a new one with all DLC included. I twitted Ed twice in two weeks but so far no response. Komplete Edition Kover Art? Might be fake, but I've never seen those images of Skarlet and Rain before. I hope it is. Rain and Skarlet look badass. Looks legit to me. Although I hope there is more than just the characters and skins. I Won't buy this since i already have every DLC. But i would have bought it if it had other stuff the normal edition had.